This unique Leeda product offers the perfect solution for sea, pike, coarse and fly anglers alike to organise, protect and simplify their rigs. 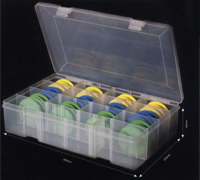 With 24 foam winders included in the box, rigs can be accessed with ease. The Leeda Rig Storage system provides 7cm size winders come in three different colours so you can specify the style of rig on each winder and again you can easily select the rig of your choice quickly. 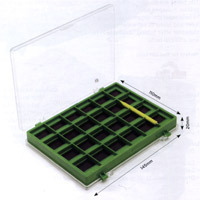 The rig storage box box will fit into the most popular seat boxes for sea and game anglers and also features an empty, long compartment with removable dividers for items such as bait needles, bait cotton, scissors, leads, etc, so you can have all the necessary rigs and tackle in one box for a successful day's angling.  24 foam winders included.  Fits inside the most popular seat boxes. Leeda's superb, 44 section, double-sided, magnetic, hook box complete with separating pencil to aid with picking up small hooks. Perfect for storing and organising hooks for the angler who fishes for a variety of species and with a varied selection of hooks.  145mm (L) x 110mm (W) x 20mm (H).